I have started decorating my house for fall this week, in preparation for the Canadian Bloggers Fall Home Tour going on next week. In planning my decor, I thought, "Where better to start than the front door?" In the past, I have only put a wreath on the front door for Christmas. 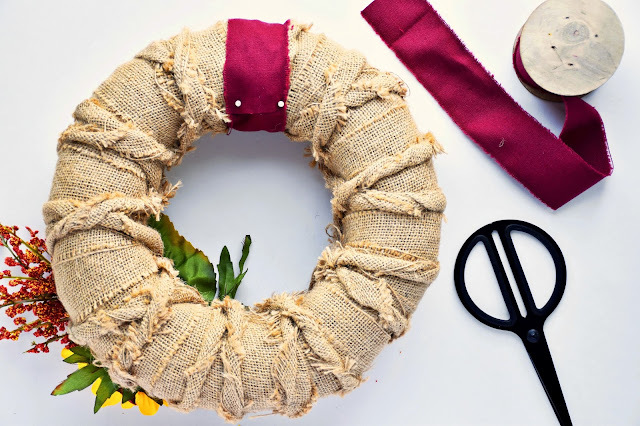 Check out my DIY Christmas wreath in last year's Christmas home reveal. 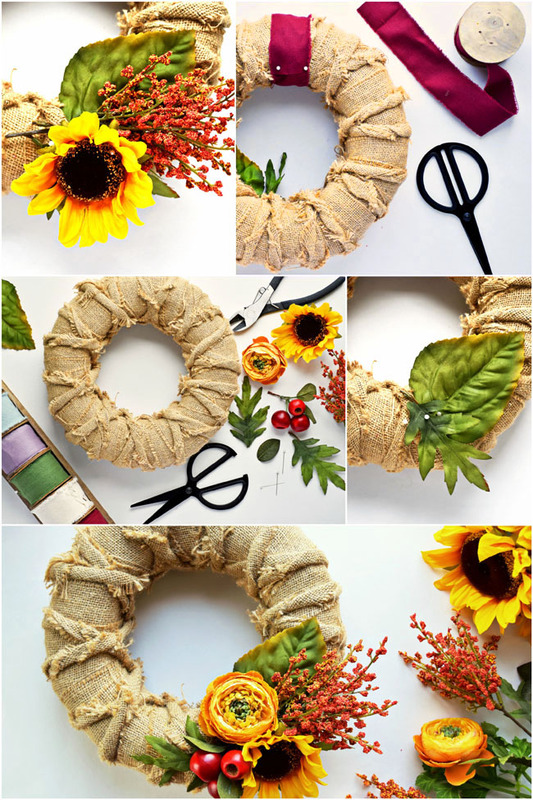 This year I've been inspired to create DIY wreaths for all seasons. 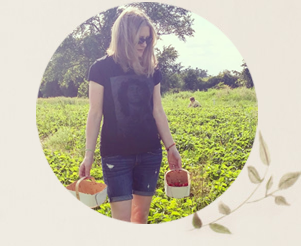 You can see my simple spring himmeli wreath (which I mounted on the inside of the front door) in this post about my pink and gold themed spring home tour. For this lovely fall season, in which we pay tribute to nature and all its warm, bold colours, I made an easy yet pretty fall wreath using a burlap-wrapped wreath form and a few types of faux flowers and berries. 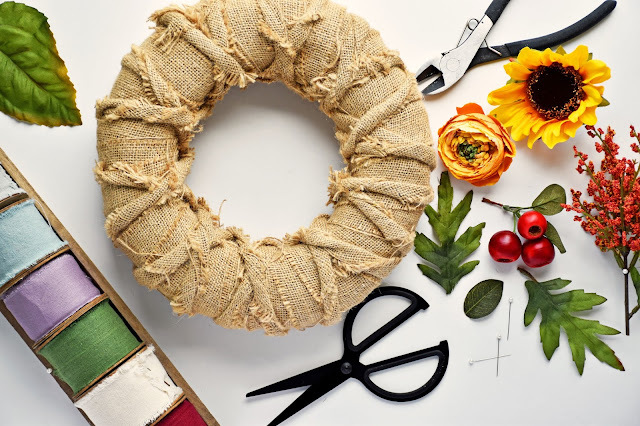 Read on for full directions for this quick DIY wreath project. 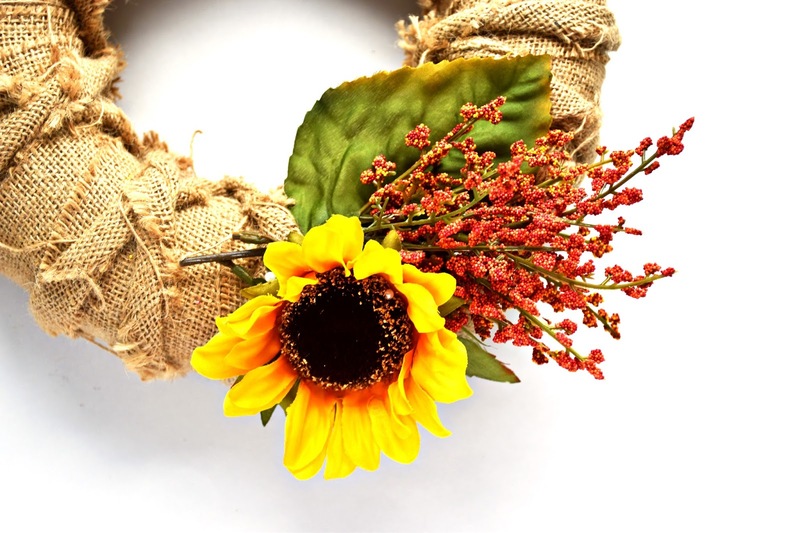 Trim faux floral blooms and leaves from their stems using floral shears. Pin one large leaf on the bottom right of the burlap wreath form using a floral pin. I pointed the first leaf up and out to the right. Pin another (different shape) leaf on top of the first leaf, pointing it down and to the right. Pin a filler-type flower arrangement on top of and in between the leaves. I used this pale red filler I bought at Michaels when the fall florals were 60 percent off. I'm not sure what the proper name of this flower is. Pin your "showstopper" flower bloom (I used a big sunflower) to the bottom left of the filler branch. Pin another (smaller) flower above the sunflower. I used an orange faux ranunculus bloom from Afloral. It's the same type I used to decorate my newly renovated powder room for this spring home tour. Pin another large leaf to the burlap wreath form on the left of the sunflower, pointing up and left. 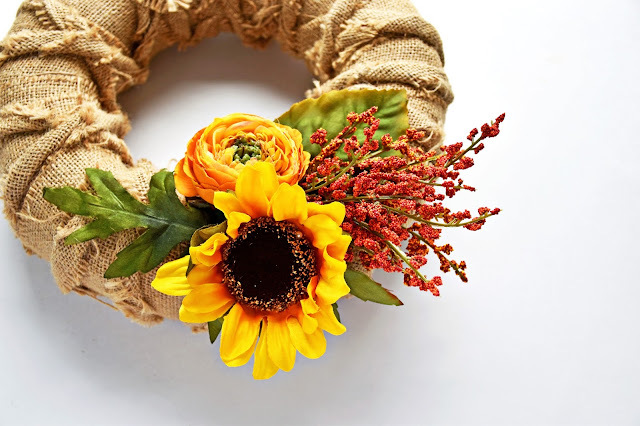 Pin berry pods to the wreath form to the left of the sunflower and ranunculus blooms, kind of tucked in between them. 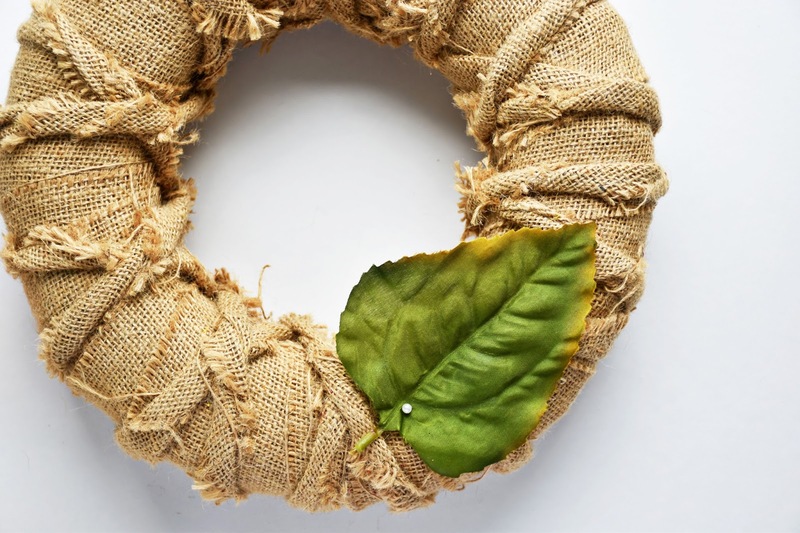 Obviously there are different ways to hang a wreath, depending on where you're hanging it. 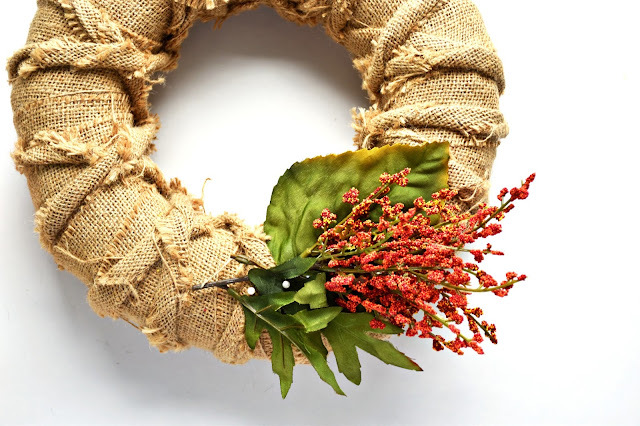 I have a steel front door and I use a magnetic hook to hold wreaths (one on the inside and one on the outside). They don't damage the door or paint in any way. You can see the ones I bought (at Canadian Tire) in this post. 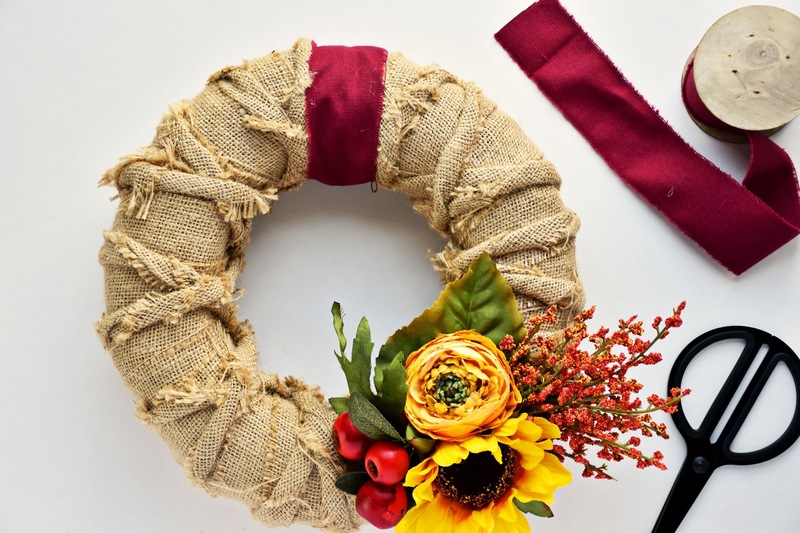 My magnetic hangers have a very small hook - it's not big enough that I can just sit the burlap wreath on top of it. So, for decorative purposes, I first cut a length of ribbon big enough to wrap around the top of the wreath form, above. I pinned it to the back of the burlap wreath with two floral pins. I then cut another length of ribbon, longer than the first. 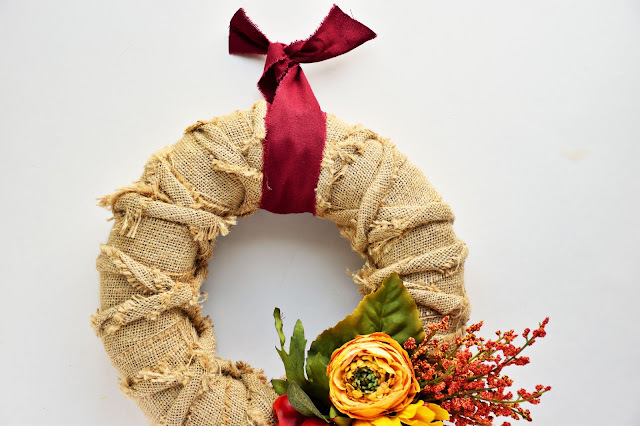 I wrapped it around the burlap wreath like the first ribbon but then tied a knot in the top. I will simply hang it over my magnetic hook...as you will see in the complete fall home tour next week! How about you? 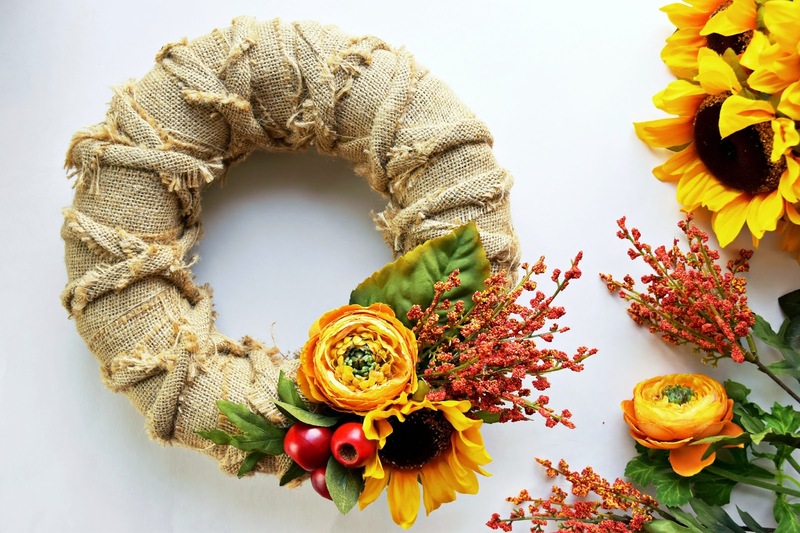 Do you use different wreaths for different seasons? 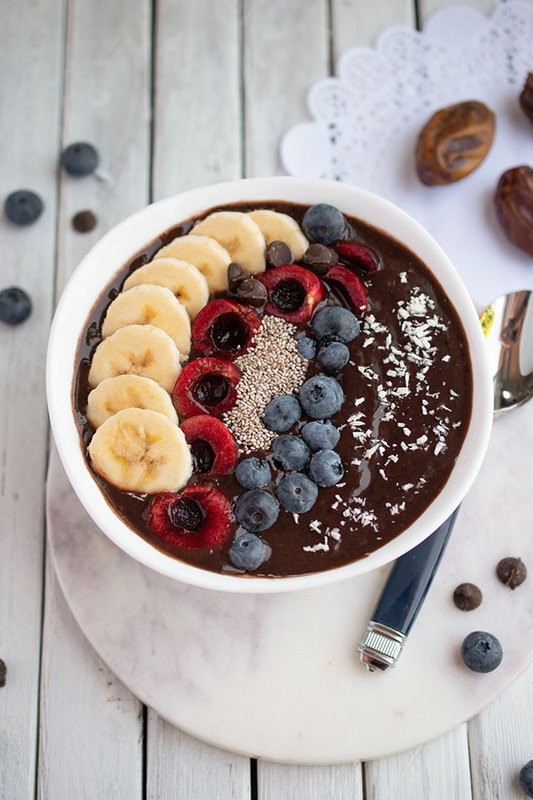 DIY or store-bought? 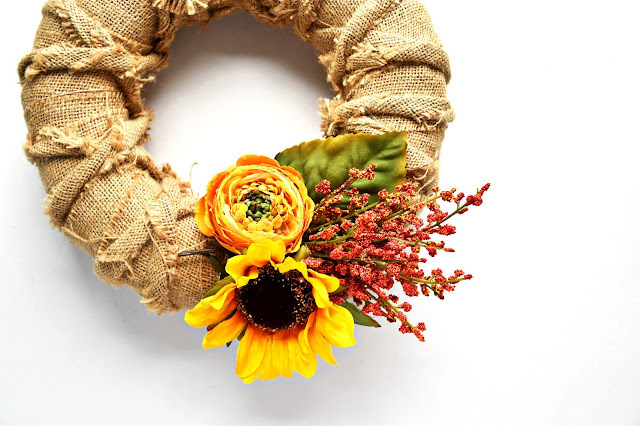 What kind of flowers would you pin on your fall wreath? So pretty! Love the bright colours. Only Holiday wreath on our door here. 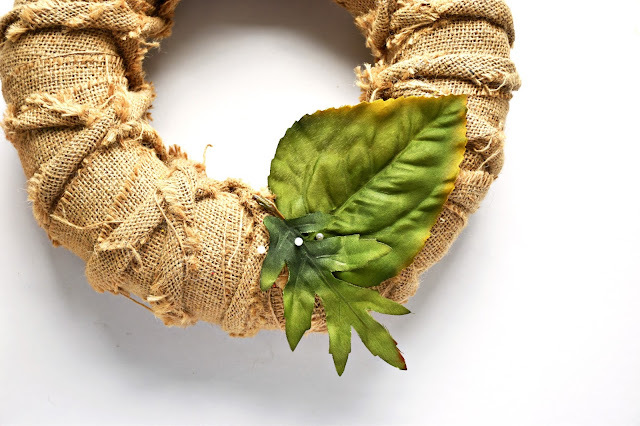 this is a great looking wreath - I love it, and doesn't look too difficult to do! Fall colours and flowers are my very favourite! The colors in your wreath are so pretty. I believe red and/or purple are very important to a fall color combo. 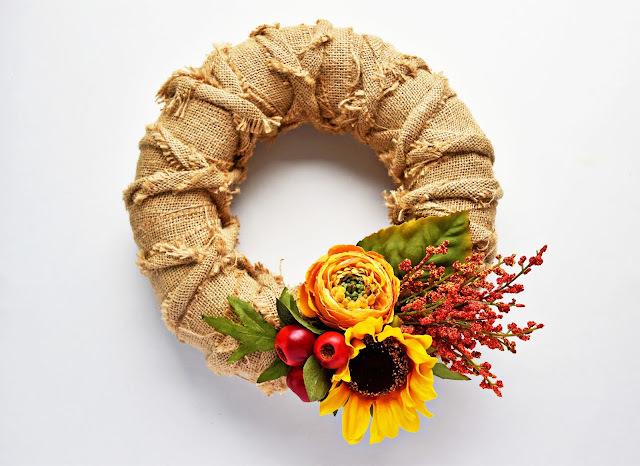 I don't have a wreath but I love this idea of decorating you own. This is actually a really pretty, easy, and inexpensive way to add a little decorative flare to the outside of your house!